Council of Europe Should not Become Russia’s Trophy – Центр "Нова Європа"
We, thinkers of contemporary Europe, call upon the Member States of the Council of Europe not to fall prey to Russia’s blackmailing and not to lift sanctions (including suspension of the voting rights in PACE) on Russia, introduced after the annexation of Ukraine’s Crimea and military aggression in Donbas. Not a single measure, required from Russia by the PACE resolutions 1990 (2014), 2028 (2015), 2034 (2015), 2063 (2015), 2067 (2015), 2112 (2016), 2132 (2016) and 2133 (2016) have been implemented. Instead, Russia has turned to blackmail, having suspended two thirds of its membership fees to the Council of Europe and boycotting all formal contacts and participation in the Assembly. Now, despite its 2016 resolution stating that the dialogue can only be restored after “significant and measurable progress towards the implementation (of previous resolutions)”, the PACE may reconsider its own commitments and invite Russia back to the table, thus lifting the sanctions with no deliverables from Russia’s side. This decision is going to be debated at the PACE session in January 2018 in Strasbourg. 2) Such a step could trigger a domino effect in the members of the Council of Europe. 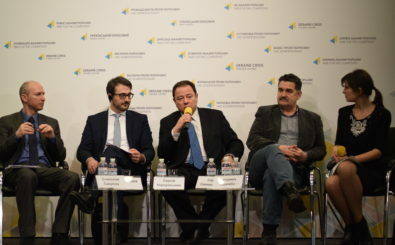 3) Last but not least, such a step would be a heavy blow to pro-European political forces and civil society in Ukraine, who would be stripped of arguments on why Ukraine’s European integration is the only viable alternative. This could, in turn, compromise all the efforts and dramatic price Ukraine has paid for its democratic and reform-oriented path. We call upon the Parliamentary Assembly and Secretary General of the Council of Europe to uphold the very mission for which it was created and reject unconditional return of the Russian Federation to the Assembly as well all attempt to blackmail the organization. Such principled position will serve the best of both, Ukraine and Europe, and their peaceful future. We invite all our European colleagues to join us in the signature of this letter.